Catalan Atlas is the finest work to come from the Majorcan cartographic school of the fourteenth century. The Catalan Atlas, is the finest work to come from the Majorcan cartographic school of the fourteenth century. Most probably produced in 1375 (the date that appears on the perpetual calendar accompanying the maps) and attributed, though without certainty, to Cresques Abraham , the atlas was already recorded in Charles V's library, in the inventory drawn up by Gilles Malet and copied by Jean Blanchet in 1380 (" une quarte de mer en tabliaux faicte par manière de unes tables, painte et ystoriee, figuree et escripte et fermant a iiii fermoers "). (BNF, Esp 30), The Catalan Atlas, Spain, Majorca 14th century. The Catalan Atlas was originally composed of 6 vellum leaves folded down the middle ; the leaves are now cut in half. They are painted in various colors, gold, and silver ; each half-leaf is mounted on one side of five wooden panels, the first half of the first leaf and the second half of the last leaf are mounted on the inner boards of a brown leather binding. Each leaf measures approximately 65 x 50 cm, for an overall size of 65 x 300 cm. Cosmographical diagram: the Earth, personified by an astronomer holding an astrolabe, is situated in the center of the Universe. 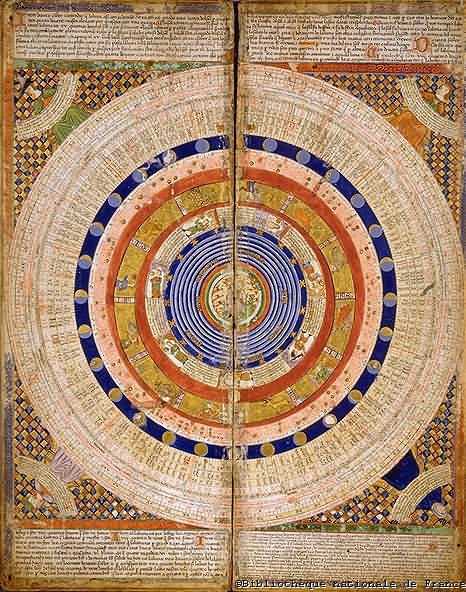 It is surrounded by concentric circles representing the four elements, the seven planets (the spheres and their personifications), the signs of the zodiac, the positions and phases of the moon. The diagram is framed by the personifications of the four seasons. The four remaining leaves make up the actual map, which is divided into two principal parts. The map shows many illustrations of cities, whose political allegiances are symbolized by a flag. Christian cities are marked with a cross, other cities with a dome. Seas and oceans are symbolized by wavy blue vertical lines. And as is usual for nautical charts, place names of important ports are transcribed in red, while others are indicated in black. Unlike many other nautical charts, the Catalan Atlas is meant to be read with the north at the bottom ; thus the maps are oriented from left to right, from the Far East to the Atlantic. The assemblage of plates giving an overall view of the document is presented as it is meant to be read, in other words with the south uppermost ; but to facilitate consultation, excerpts from the Atlas are shown with the north uppermost. The two last leaves form a fairly standard portolan chart of the same type as Angelino Dulcert's 1339 map. However, at the westernmost point, near the first wind rose (compass card) ever drawn on a portolan chart, is a commentary concerning the mythical " Iles Beneventurades, " the Fortunate Islands described by Pliny the Elder and Isidore of Seville, as well as an illustration of the no less mythical" Insula de Brazil ". Also worthy of note is the repetition of the islands of Corsica and Sardinia on two successive leaves creating an area of 'overlap' in the middle of the Mediterranean Sea, (this feature does not occur in the oriental portion of the Atlas). In Africa several sovereigns are portrayed (including the king of Mali, " Musse Melly, " Mansa Musa, who wields a scepter ornamented with a fleur-de-lys, and the king of Organa, an armed Saracen). " Tenbuch " (Timbuktu) is also represented, as is the ship of Jaume Ferrer who set sail in 1346 for the " Riu del Or " (River of Gold) in quest of a sea route around the Atlas mountains, which impeded travel to the African interior where the Genoese and Catalans hoped to find gold and ivory. The first two leaves, which form the oriental portion of the Catalan Atlas, illustrate numerous religious references as well as a synthesis of medieval mappae mundi (Jerusalem is situated virtually at the document's center) and the travel literature of the time, notably Marco Polo's Book of Marvels and the Travels and Voyage of Sir John Mandeville. For example in the land of 'Catayo' (China), the map shows the city of 'Chambaleth' (Beijing) where the Great Khan resides, Sumatra (" Illa Trapobana "), and a coastline edged with a multitude of many-colored islands that recalls the circumfluent ocean of the Orbis Terrarum. To the east of the Caspian Sea, the map is based on biblical and mythological references, as well as on borrowings from travelers' narratives : Moses' passage of the Red Sea, Mount Sinai, Mount Ararat, the Tower of Babel, the Magi following the star, Christ the King, Mecca, Babylon, the Queen of Sheba, " Illa Jana, " home of the mythical realm of the Amazons (" Regio Femarum " (sic)), Sirens, the kingdom of Gog and Magog, Alexander the Great, Pygmies battling storks (whose presence in the mountains of Asia was attested by Pliny the Elder, but refuted by Marco Polo), etc. Despite the map's rather approximate cartographical design, many Indian and Chinese cities can be identified. The explanatory texts report customs described by Marco Poloand catalogue local economic resources, real ones or supposed ones. This, indeed, is perhaps the most interesting aspect of the Catalan Atlas : to the east of the well-defined Mediterranean world lie immense regions whose economic importance is clearly understood, but which remain mysterious and unexplored. This world of spices, silks, and fabulous riches described by Marco Polo is the one that Christopher Columbus would attempt to reach by a western route 117 years later. The oldest sea charts in existence, linked to the emergence of the compass, are of Genoese or Venetian origin ; the earliest examples date from the late thirteenth century. They generally show the Mediterranean basin (" Mare nostrum " ) drafted with astonishing cartographic precision, considering the technical means available to the mapmakers of that time. In 1137 the kingdom of Aragon incorporated Catalonia, a trading partner of North Africa where mapmaking was a strong tradition, and later annexed the Balearic Islands in 1229. These circumstances fostered the rise of a highly important and flourishing cartographic school, owing in particular to the contributions of Arab and Jewish scholars. What characterized this school was its lavish, vividly colored illustrations (of cities, significant geographical features, portraits of foreign rulers, rich toponymy, etc.). 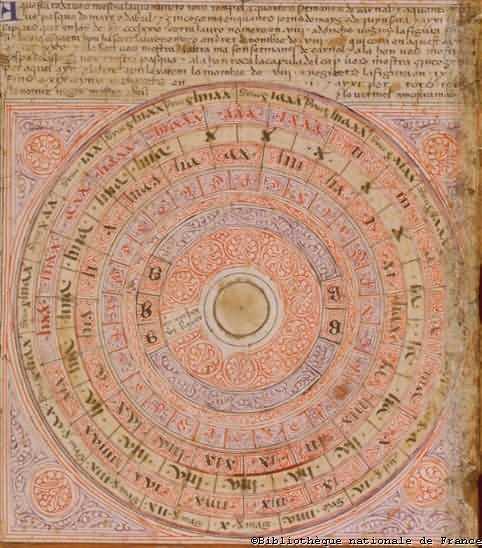 Even before the first map was produced in Majorca, the Catalan scholar Ramon Llull included the sea chart among navigational instruments, on a par with the compass. In 1354 King Peter of Aragon decreed that two charts should be carried on all the ships of the realm. The portolan chart drafted in 1339 by Angelino Dulcert (BNF, Res Ge B 696), was the first map known for certain to have been produced in Palma, on Majorca. It is thus one of the " prototypes " of Catalan maps drawn in the fourteenth and fifteenth centuries. All of the typical features are present : colors, place names, drawings of topographical details (mountains, rivers, lakes, major cities, ports or inland towns, personalities, etc. ), as well as keys and explanatory notes written in Latin, all features not usually found on Genoese or Venetian portolans. Moreover, this document marks a departure from the strictly " Mediterranean " frame of reference of earlier portolans, for it attempts to represent northern Europe and include more information concerning Africa. The Catalan Atlas, dated 1375 and attributed to Cresques Abraham, presents important similarities with Dulcert's portolan chart in the drawing of its occidental portion, augmented with a great number of explanatory legends. Its originality lies in the addition of an oriental half which is not based on the experience of Mediterranean sailors, as was the case with portolan charts, but makes use of all manner of sources, including the account of Marco Polo's voyage in the late thirteenth century. The portolan drafted in 1413 by Mecia de Viladestes (BNF, Res. Ge AA 566) is another interesting example of the Majorcan school. It reproduces the geographical framework of Dulcert's portolan chart, the rich array of paintings and explanatory legends of the Catalan Atlas, and it reflects the same fascination with African gold and knowledge of the overland routes leading to it.